The Yewdale Roller Blind Assembly Table is a smart and convenient way to produce roller blinds, availabe in a choice of 2.6, 3, 3.5 and 4.2 metre widths. Ergonomic, slim and designed specifically for your factory, this assembly table ticks all the boxes. As used by Yewdale, features have been added to improve productivity. A key feature is how little space this table takes up. Four Yewdale assembly tables fit within the footprint of one traditional roller table; quadrupling your production capabilities and preventing bottlenecks in the manufacturing process. The fabric is held in an air clamp which is operated at the flick of a switch. No more heavy magnetic clamps of yesteryear, air clamps are the easiest and smoothest way to hold the fabric. There are plenty of additional extras available to go with these tables. 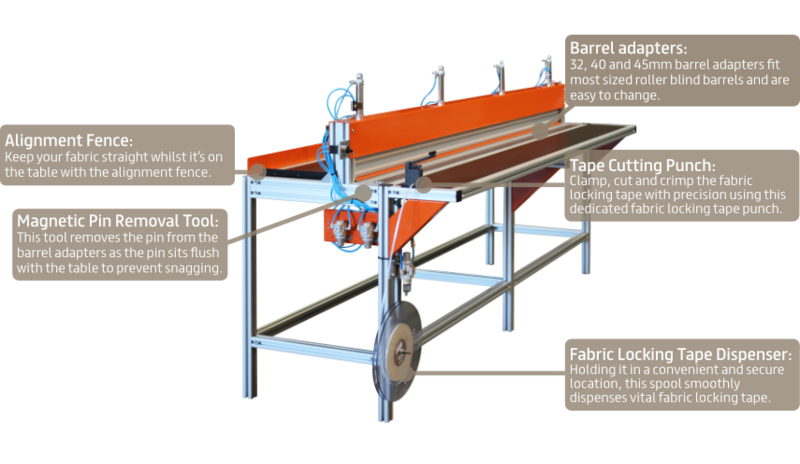 Barrel adapters, fabric locking tape dispenser, fabric locking tape cutting punch, fabric locking tape, insert tools and creasing tools all make the production process quick and easy, as you’ll see from the video below. Made with speed in mind, this assembly table comes with everything you need to build a roller blind in one designated station, especially by including the extras. With the fabric locking tape dispenser providing tape to the tape cutting punch which tapers, punches and cuts cleanly, everything has been designed with the single vision of increasing productivity and workflow. A rear alignment fence ensures the fabric is kept perfectly square while production is being undertaken. The switch-operated air clamp is easy to use and is quiet, reducing the old method of heavy magnet clamping to the history books. The Yewdale Roller Assembly Table is available in four sizes, providing a solution for any type of production space without restrictions. It’s available with free delivery and is made to the highest standards, requiring no assembly when it arrives – just connect it to your air supply. Ergonomic, quiet and safe, these tables make roller blind assembly an easy task, freeing up time for more work and helping to keep your business moving forward. Work smart and unlock your business’ efficiency with a Yewdale Roller Blind Assembly Table. Available in a choice of four sizes: 2.6 metres, 3 metres, 3.5 metres and 4.2 metres wide. Fabric Locking Tape Dispenser – Holding it in a convenient and secure location, this spool smoothly dispenses vital fabric locking tape. Tape Cutting Punch – Clamp, cut and crimp the fabric locking tape with precision using this dedicated fabric locking tape punch. Alignment Fence – Keep your fabric straight whilst it’s on the table with the alignment fence. Barrel Adapters – 32, 40 and 45mm barrel adaptors fit most sized roller blind barrels and are easy to change. Ergonomic Design: Built to an optimum height for ease of use and the comfort of your production team. Made Specifically: Yewdale uses these tables as part of our daily roller production process, so rest assured, it is to the highest specifications. Space Saving: The narrow assembly tables allow for four tables in the space normally taken up by one large assembly table. Fine Precision: Work with precision thanks to accessories such as the alignment fence, which keeps the fabric perfectly straight. Work Smart: Maximise space and reduce product lead times, keep your production line on schedule even during the busiest periods.